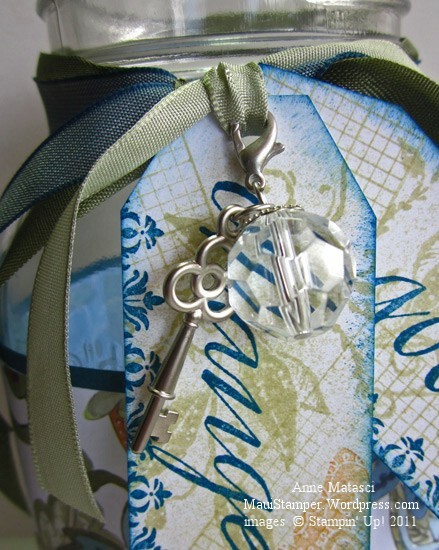 A Trinket Key, a Clear Bauble and some ribbon finished up my jar and it’s ready to be fed. 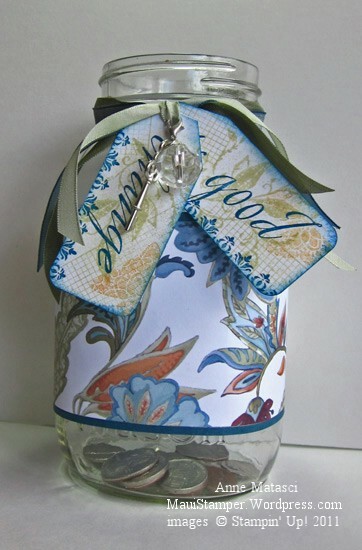 This one is designed to coordinate with the colors in my bedroom, but I’m going to make another one for the laundry room. It’s my opinion that any and all cash (coin or bills) found in the laundry belongs to She-Who-Washes-The-Clothes. I consider it tip money. At a minimum, I’ll need it to be able to pay the second-checked-bag fee next year. Cute! Cute! I need one just for my monthly orders!